Dive Two Wrecks in One Day on this Wreck Diving Trip in Bali. 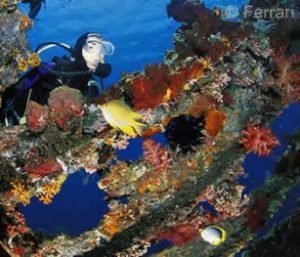 Dive the famous USAT Liberty Wreck in Tulamben, and the new Kubu wreck. Two Shipwrecks in One Day?! Yes, really! Bali has a new shipwreck – it’s very conveniently located in Kubu, just north of Tulamben Bay. Tulamben Bay is the location of the world-famous 120m USAT Liberty shipwreck. Now named ‘Relax Bali’, the 150 ton boat is over 38m in length, and was built in Holland in 1952. More recently used as an Indonesian government patrol boat, it was sunk to create an artificial reef … aiming to attract both marinelife and divers! AMD-B is offering a “Two Shipwrecks in One Day” (2S1D) Day Wreck Diving Trip. What a wonderful day: Relax Bali: A totally intact boat and the USAT Liberty in Tulamben Bay: Beautifully encrusted with hard and soft corals; home to a wide variety of marinelife.